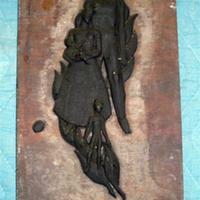 Black clay relief on wood board. Figures of a father, mother and child. The father stands in the background with his wife in front of him carrying a baby. A small child stands in front of the mother in the foreground.